Welcome to Joliet's finest sushi bar, Japanese and Asian restaurant -- Sushi Ya. We now offer our famous All-You-Can-Eat menu every day (closed Sundays). So come on in and take advantage of a fresh and healthy diet of fish and sushi at our new, low All You Can Eat prices. You will also want to try our delicious kitchen food (also on our new menu), like our signature, mouth-watering Beef Negamaki, or our savory Hibachi (Teppan) style grilled food. 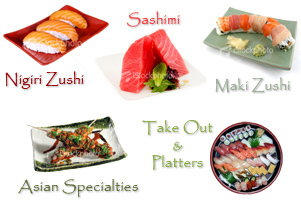 Stop in today during our convenient lunch and dinner hours six days a week and tell us you found Sushi Ya on the web! Kampai! Check back soon for more coupons, but our prices our so low you won't need any! All You Can Eat lunch and dinner now offered every day of the week that we're open (we are now closed Sundays - we need a day of rest too)!